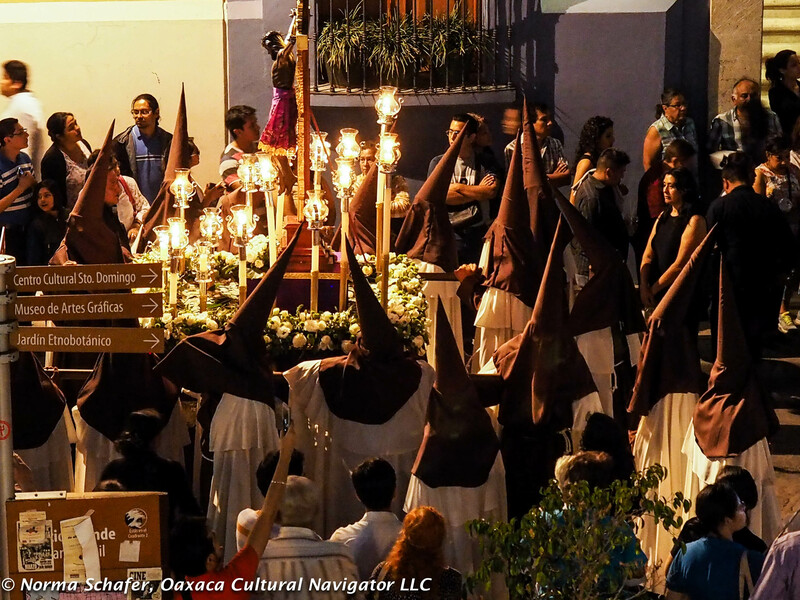 Holy Week or Semana Santa in Oaxaca, Mexico, is coming to a close for 2016. 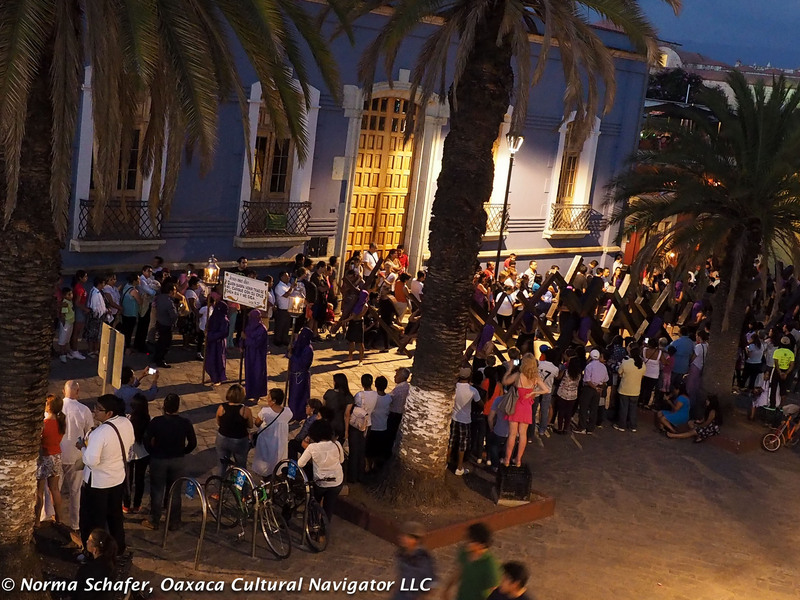 On Good Friday, the Procession of Silence that re-enacts the trial, crucifixion, death and burial of Jesus (14 Stations of the Cross) starts around sunset and winds through the main streets of the historic center. 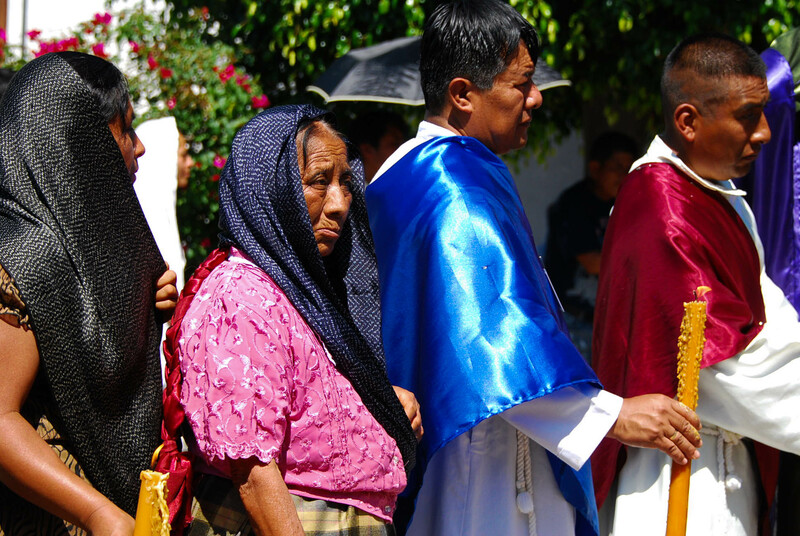 Leading the procession is Archbishop Jose Luis Chavez Botello and other leaders of the Roman Catholic Archdiocese of Antequera, Oaxaca. 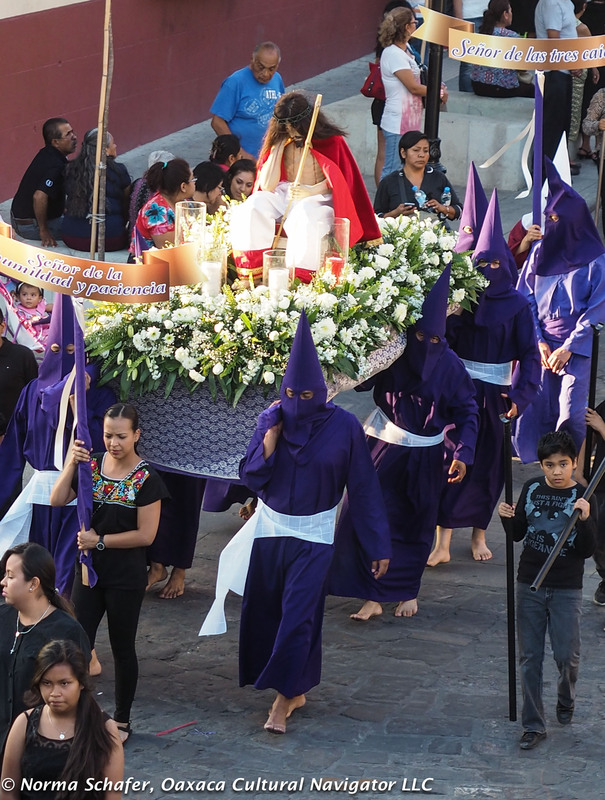 Spanish Catholicism came to Mexico with the conquest and many areas here observe Semana Santa with devotion that include influences from indigenous tradition. 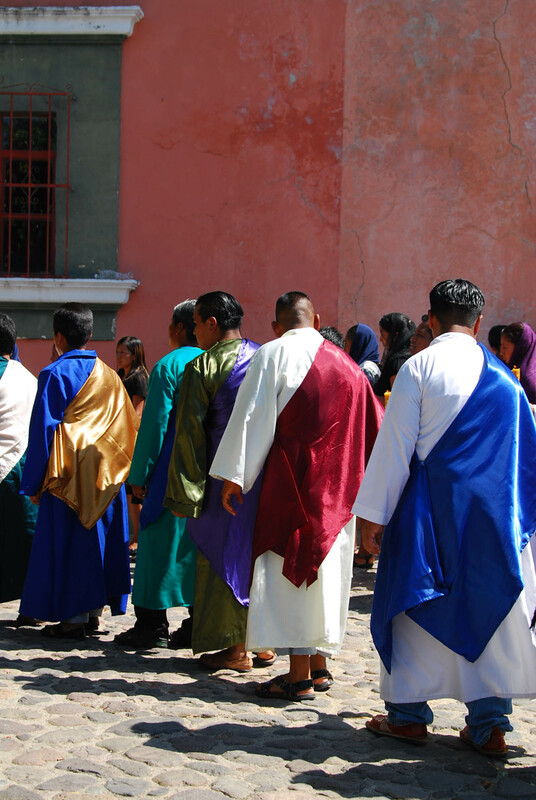 In Oaxaca city, the Procession of Silence is probably more akin to its Iberian Peninsula origins. 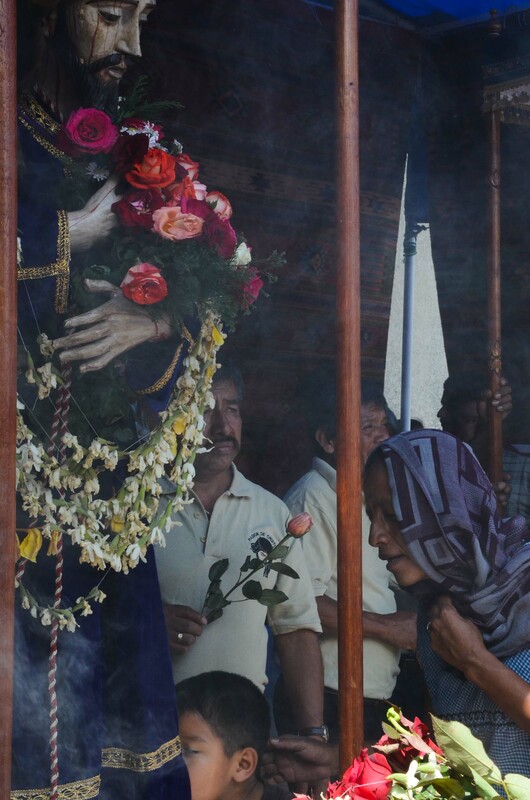 Solemn, spiritual, filled with the images of belief and sacrifice, the procession draws visitors from throughout the world. At its apogee, the crowd was at least 10 people deep. 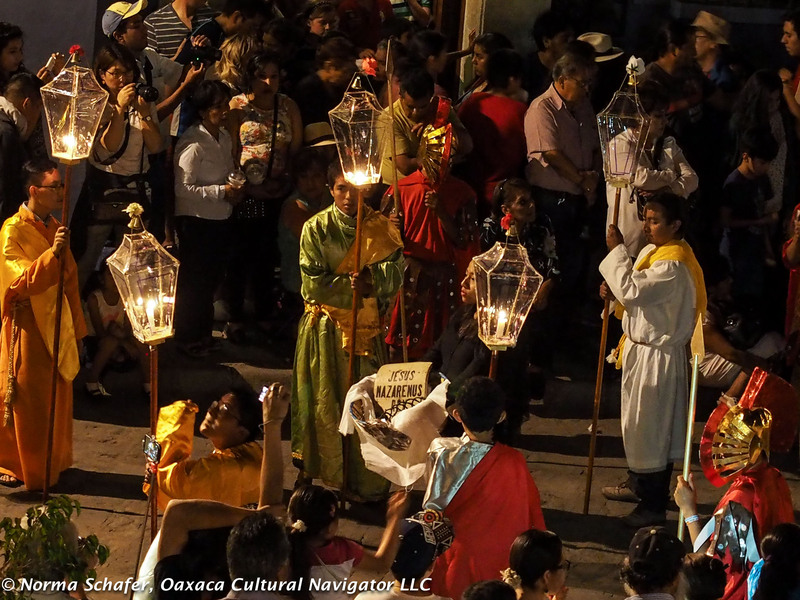 The mystery is further heightened by the metered beat of a drummer, candlelight, rebozo draped women, hooded men, the eerie sound of crosses dragging on the cobbled streets, and the illumination of a full moon. 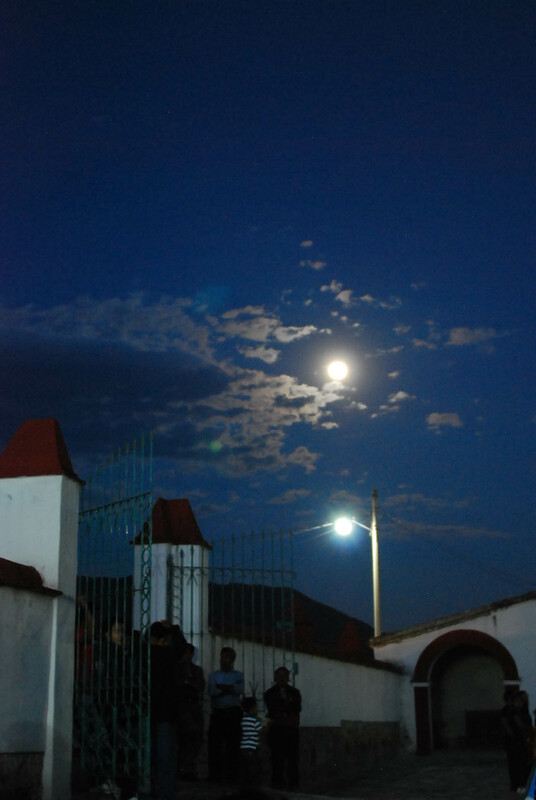 I usually spend Easter week in Teotitlan del Valle, so this was a new experience. What I heard about from friends beforehand was the description of men wearing pointy hats, a reminder of the Ku Klux Klan in the United States. Let’s be clear. We don’t want to confuse the two! 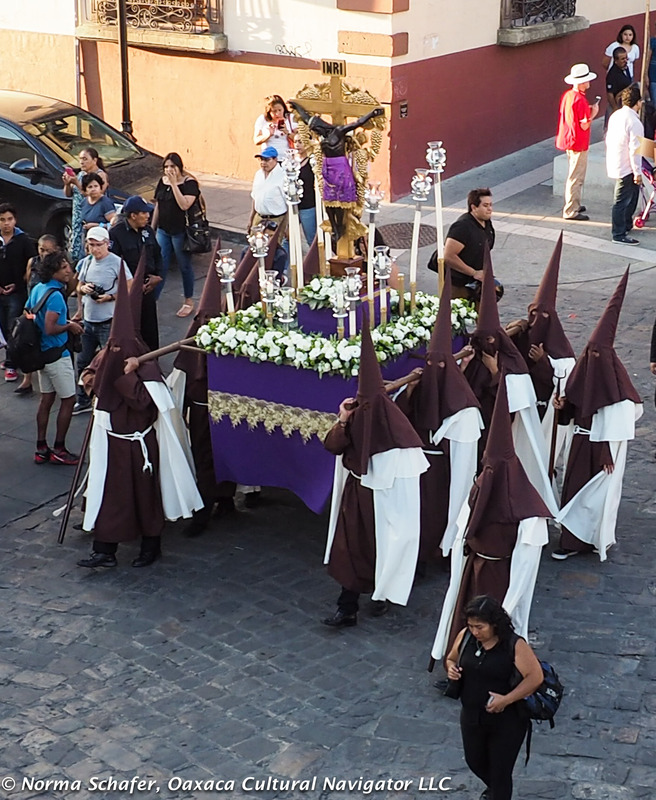 The conical hood, called a capriote, hides the face of the person wearing the nazareño cloak. This is a garment of Medieval origin and associated with the Passion of Christ. 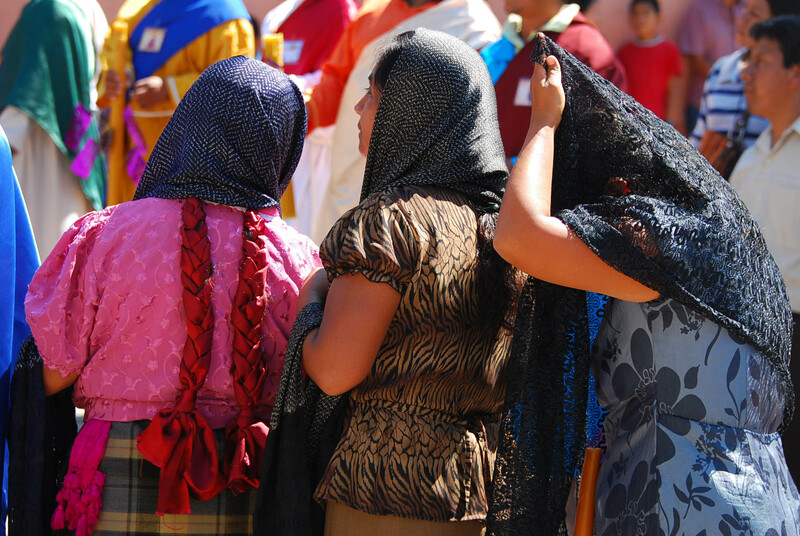 I am not Catholic nor am I religious, but I consider myself spiritual, observant and respectful, so understanding the rituals and traditions of Catholicism in Mexico, where I spend a good part of my life, is important to me. 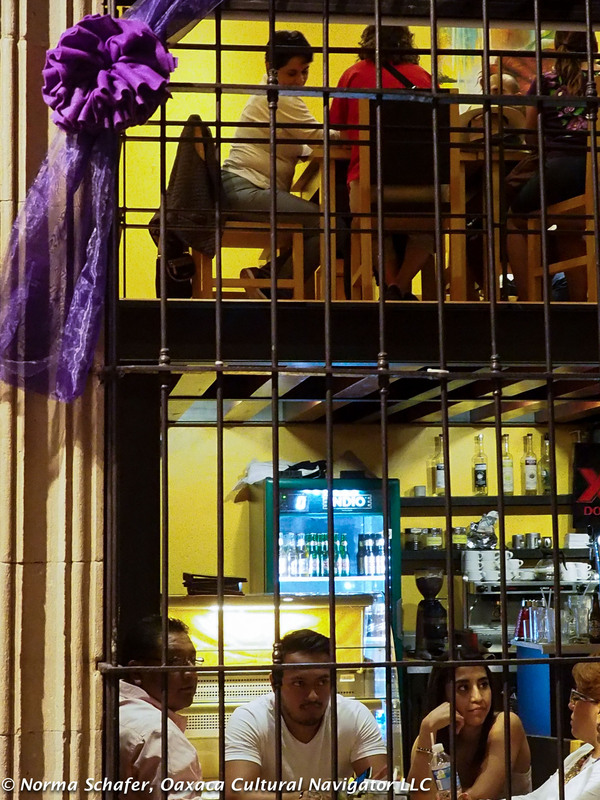 We had a great perch on the rooftop patio at Mezzaluna, at the corner of Garcia Virgil and Allende, in clear view of Santo Domingo Church and the procession as it passed below. 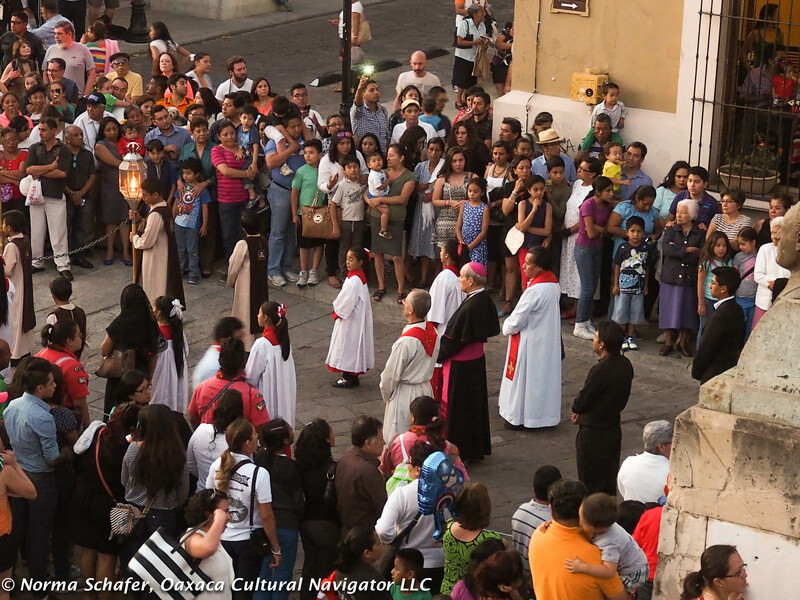 This is the corner where the procession began and ended. Cost of admission was a delicious pear and gorgonzola pizza, sueros (I like mine plain, Victoria beer. 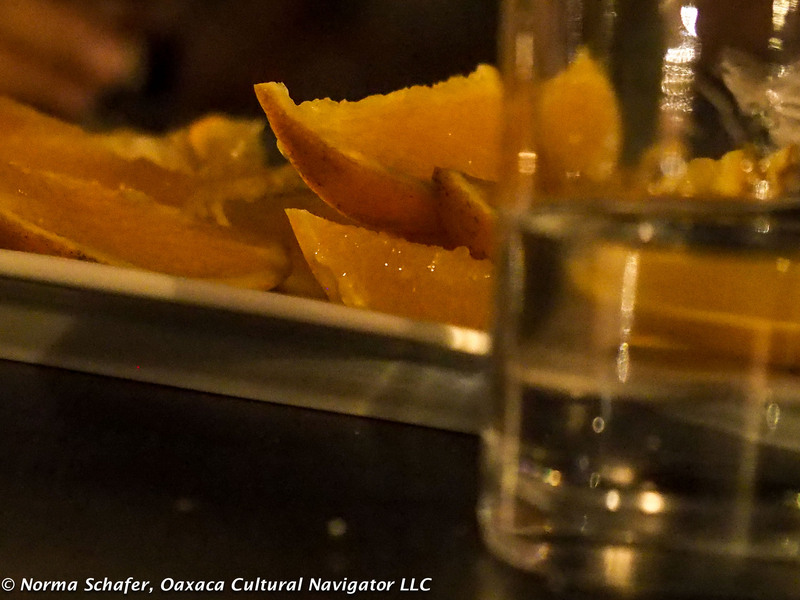 fresh squeezed lime, and a salt-rimmed chilled glass) and mezcal. The house espadin mezcal was especially delicious, especially since it came in a double-shot tumbler size glass! 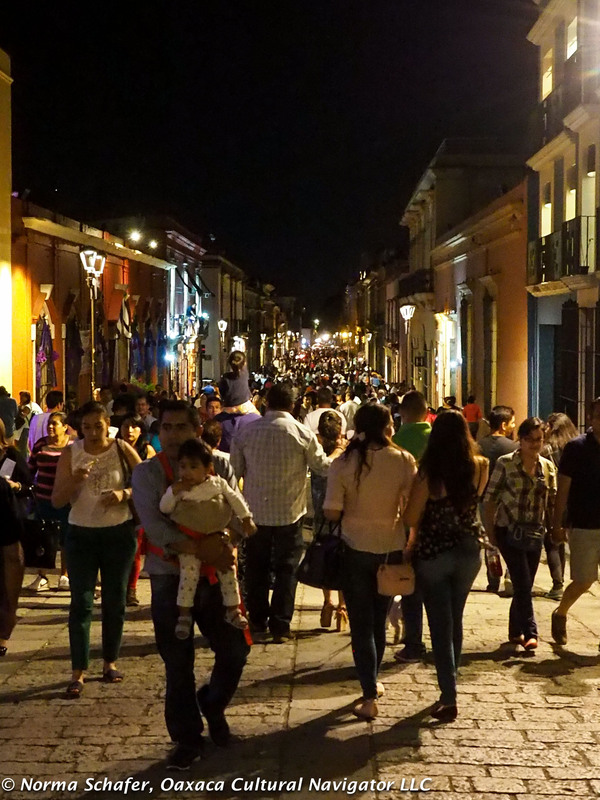 As the procession ended, the crowd dispersed to fill the walking street/andador Macedonio Alcala, the adjacent artisans markets, and restaurants open late to feed all the hungry visitors. 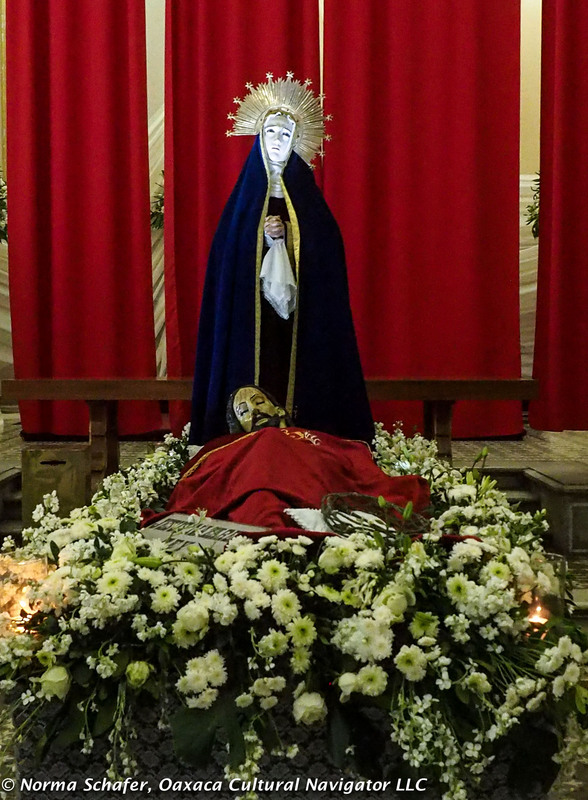 As I walked by Templo de Sangre de Cristo at the corner of Alcala and M. Bravo, I was moved to enter where I saw figures carried in the procession at rest inside the church. 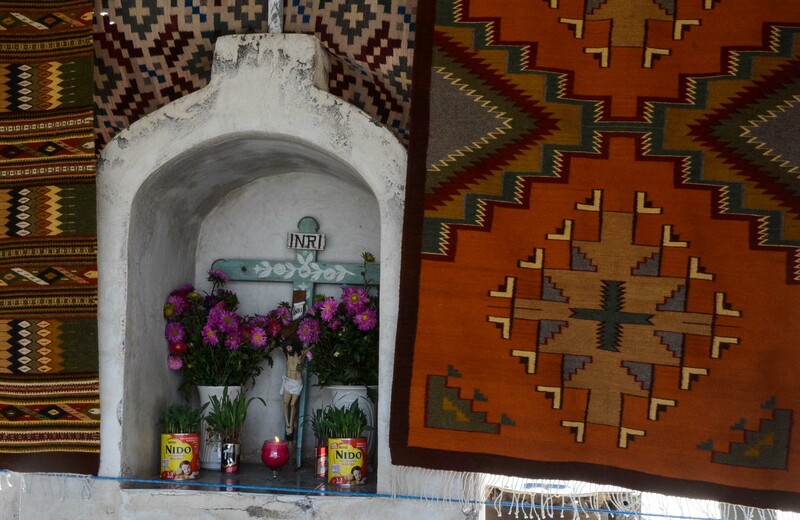 The altar was draped in red cloth as were all the saints in their wall niches. People sat in silent prayer. 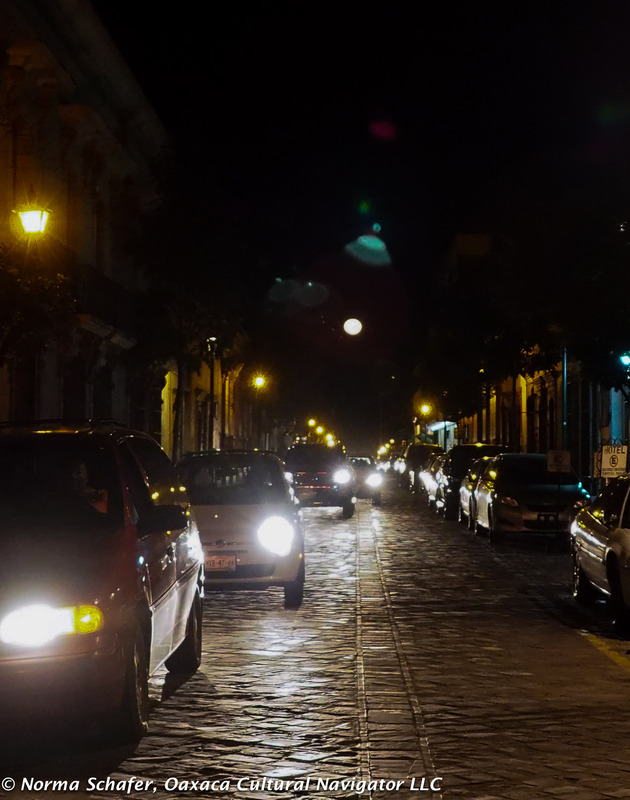 Back on the street, I passed Ave. Morelos, where the full moon hung low in the sky, a backdrop to street lights and headlights. As I meandered back to where I stay in the city, it was a perfect ending to a great day and a reminder that life is in the beauty of each moment. 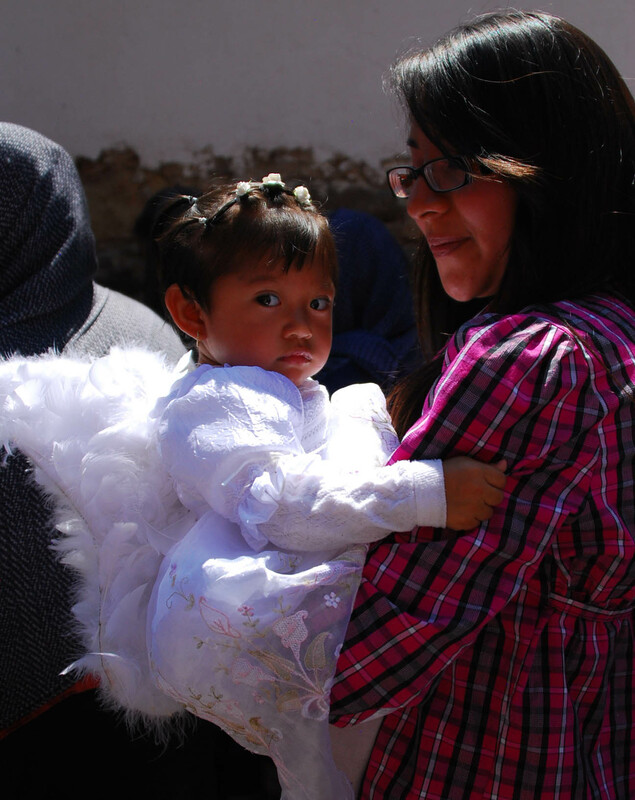 And, of course, there are the children, who hold all the promise of a future yet to unfold. 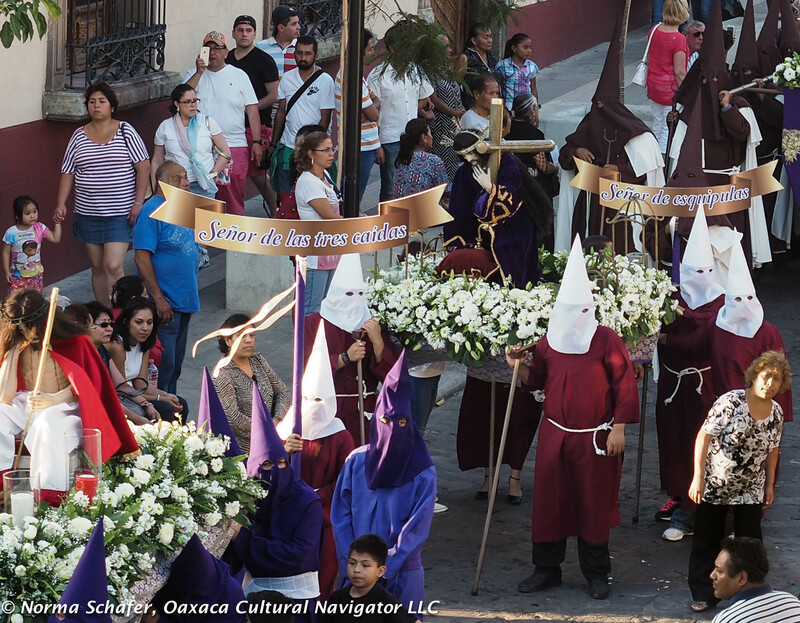 Welcome to Holy Week — Semana Santa in Mexico, a mysterious and magical experience for anyone who is religious or not. 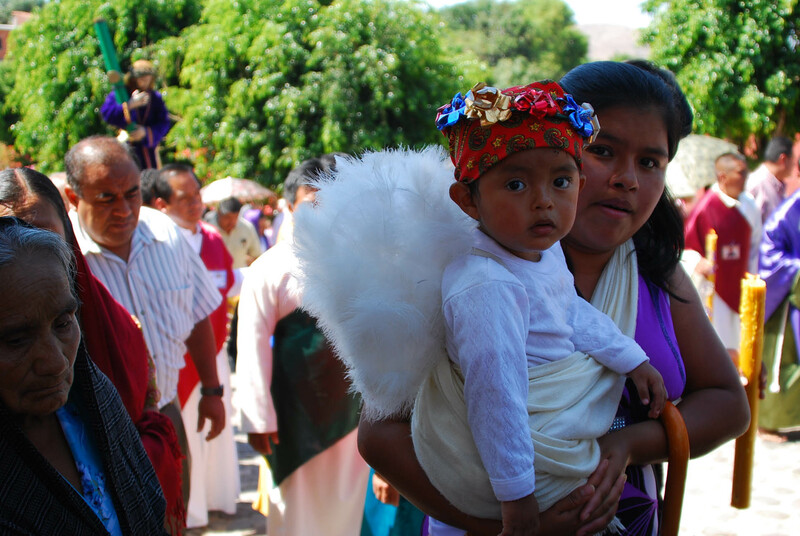 Today is Maundy Thursday in the Zapotec village of Teotitlan del Valle about 40 minutes outside Oaxaca city off the road to Tlacolula de Matamoros. 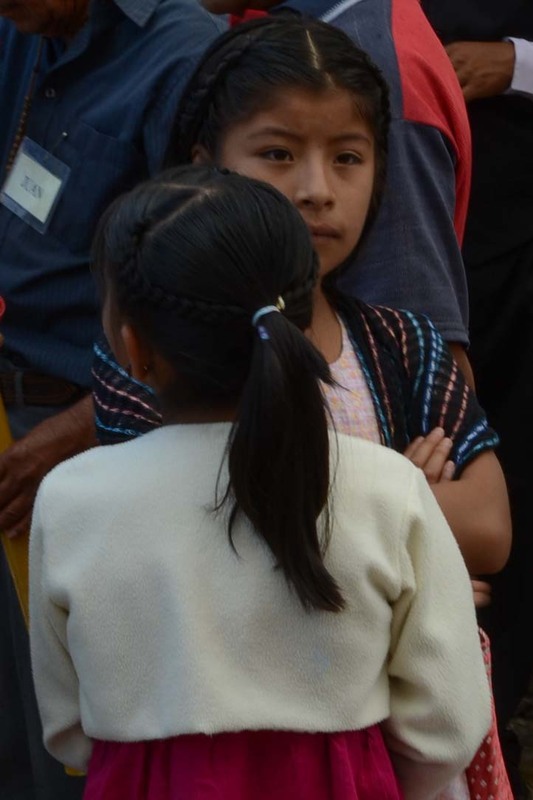 Catholic and indigenous beliefs merge here into what cultural anthropologists refer to as syncretism. For example, Maundy Thursday celebrates the Last Supper when Jesus and his followers gathered for a Passover seder the night before the crucifixion. So this is not an evening event that happens at sundown in the ancient Jewish tradition. Here The Last Supper happens early in the day. Why? Quien sabe! So you might want to get here early. 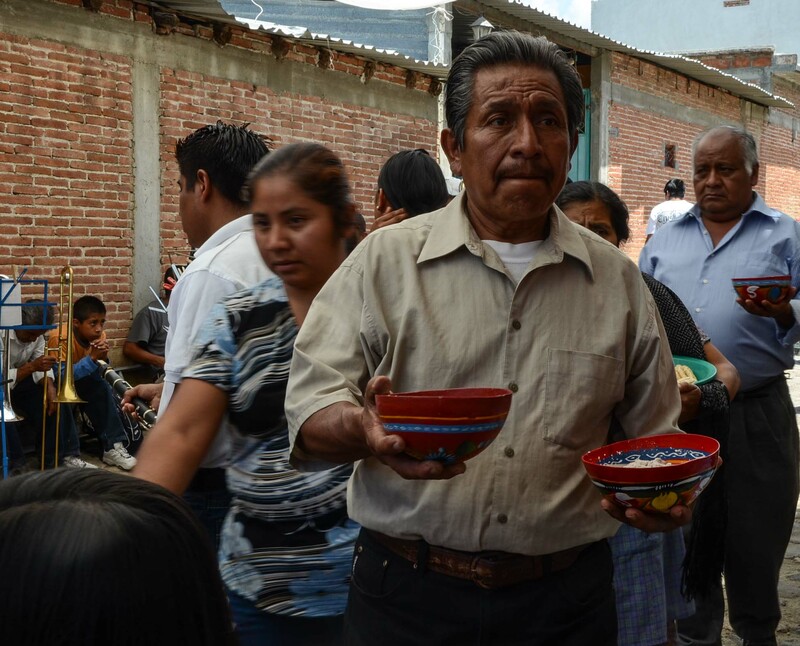 There will be the symbolic foot washing ceremony and then all gathered will eat — usually delicious tamales. 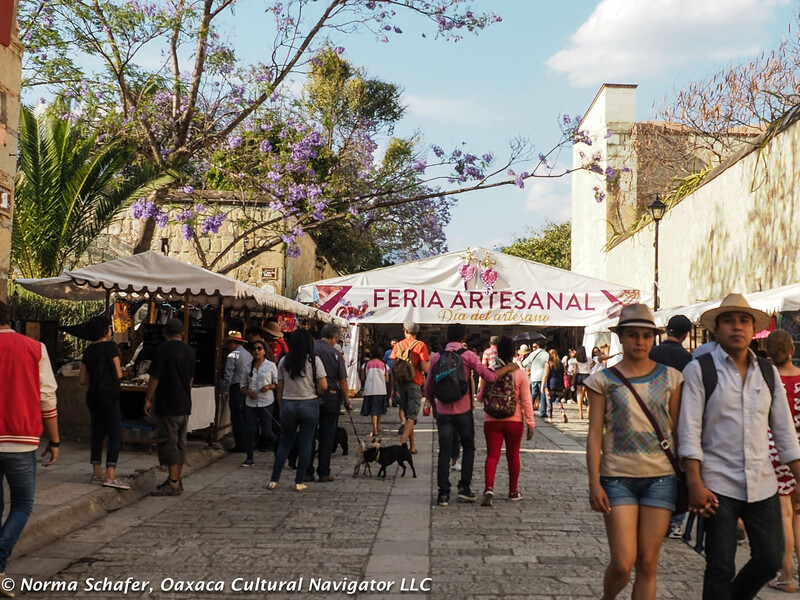 How to Get Here: Jump on the bus at Chedraui on the Periferico. 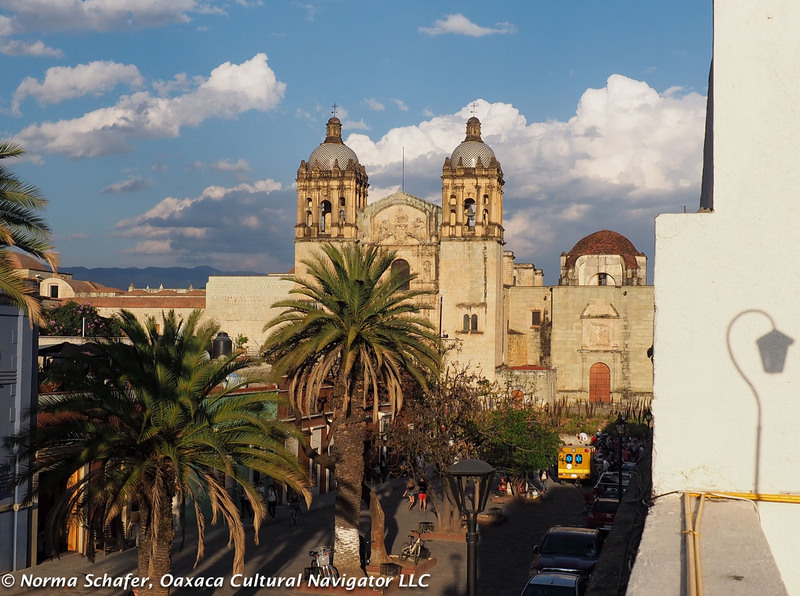 Take any bus going to Tlacolula or Mitla. 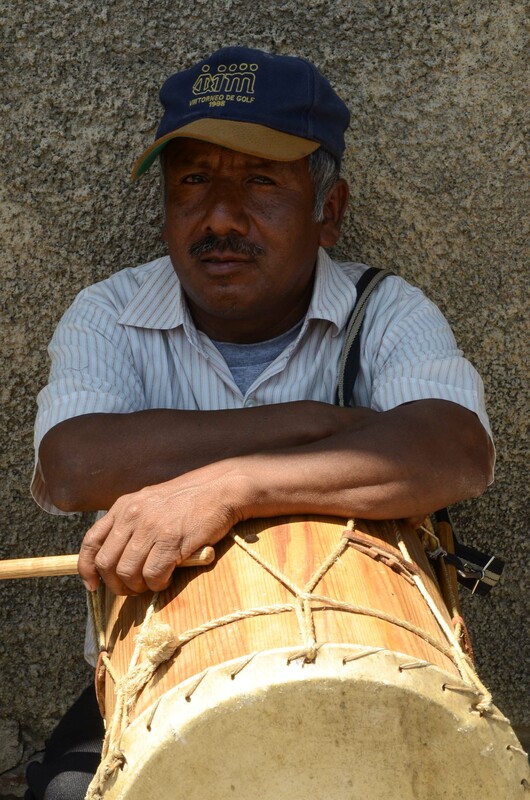 Get off at the Teotitlan del Valle crucero (crossroad) and get a village taxi or tuk-tuk into town. Or, you can get a colectivo at the Telcel/Volkswagen corner near the baseball stadium on Niño Heroes. 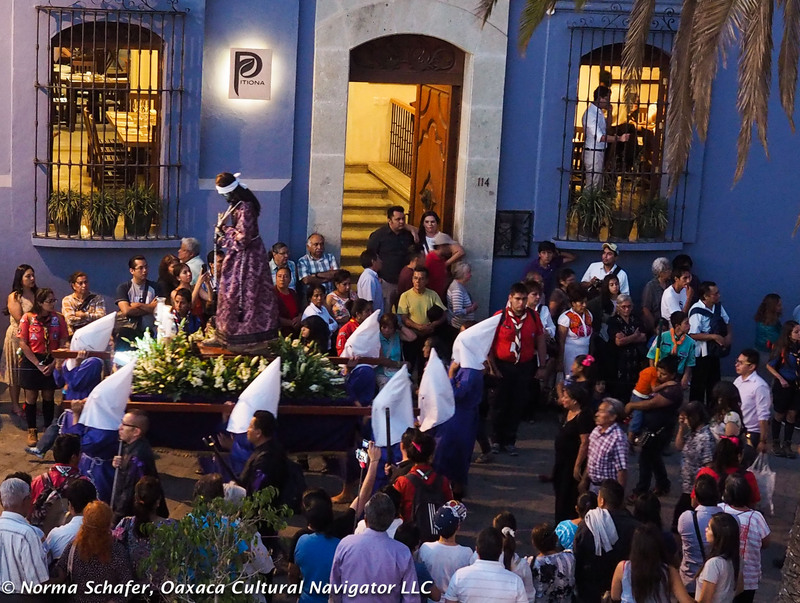 Where to Stay: Consider staying overnight to participate in the Good Friday ceremonies, too. 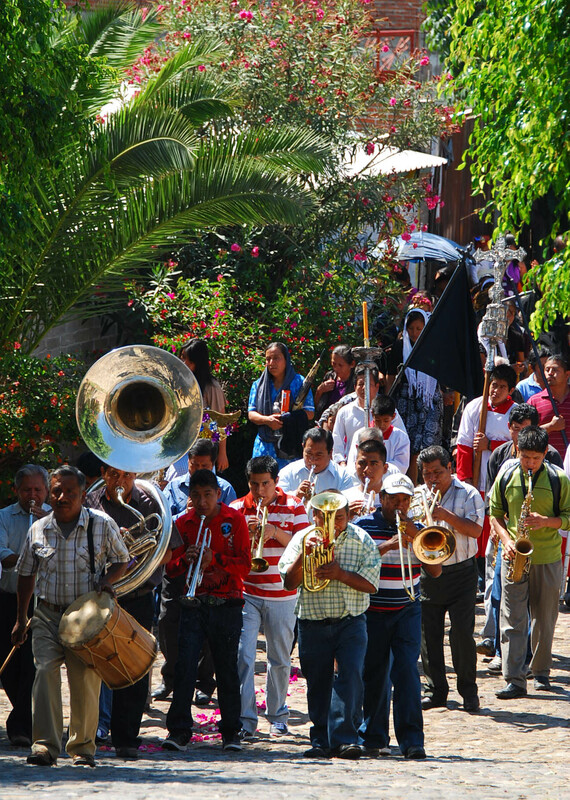 Casa Elena B&B or Las Granadas B&B are good choices. 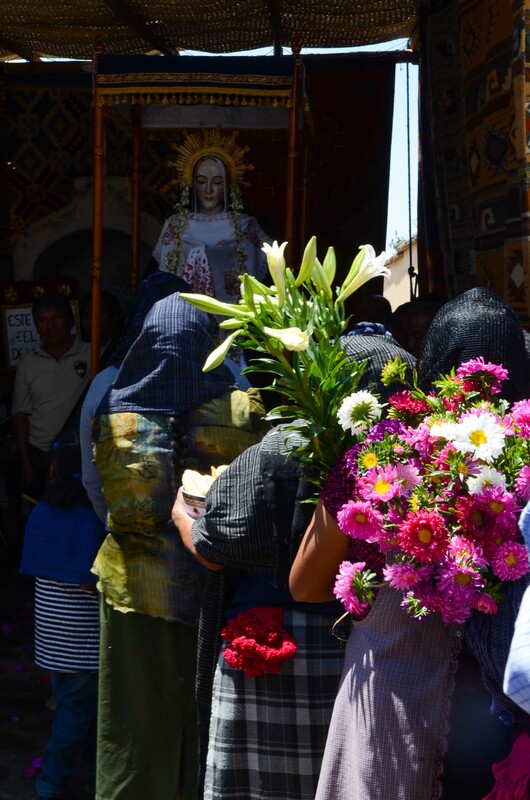 Lunes Santo or Easter Monday is celebrated with reverence in the Oaxaca village of Teotitlan del Valle where I am living. 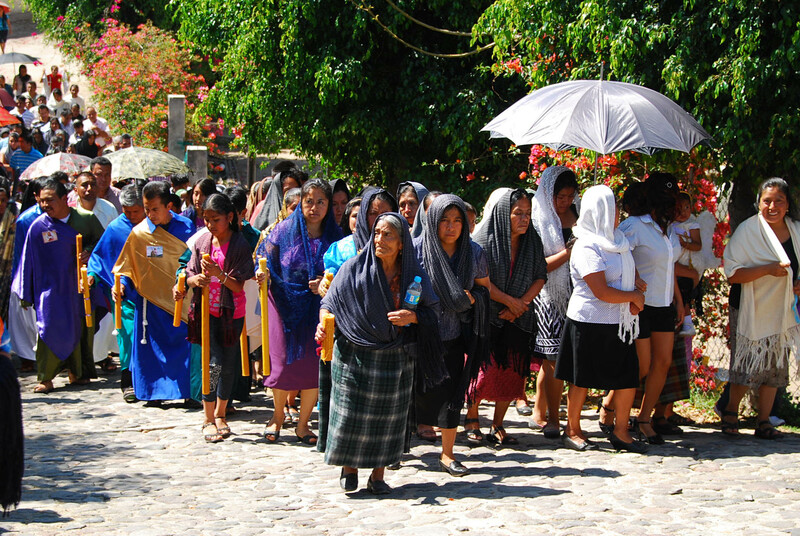 This is a day of prayers and offerings, of procession and peace. 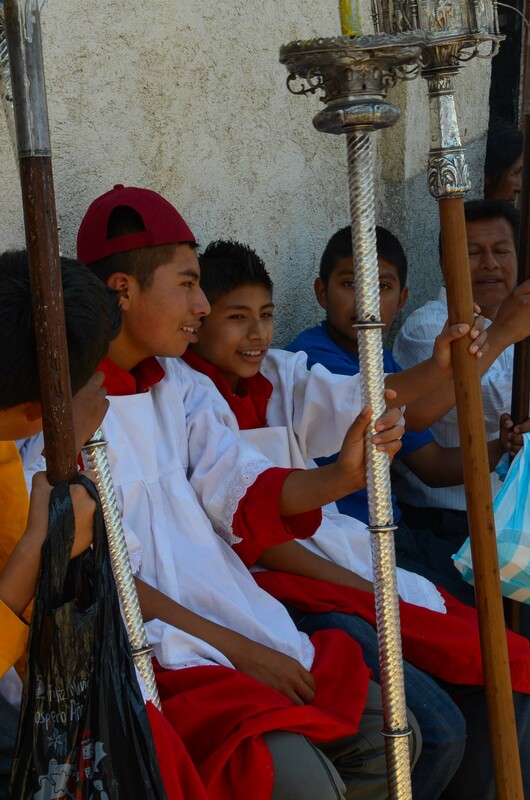 The week before Easter, known as Semana Santa in Mexico, begins on Palm Sunday. 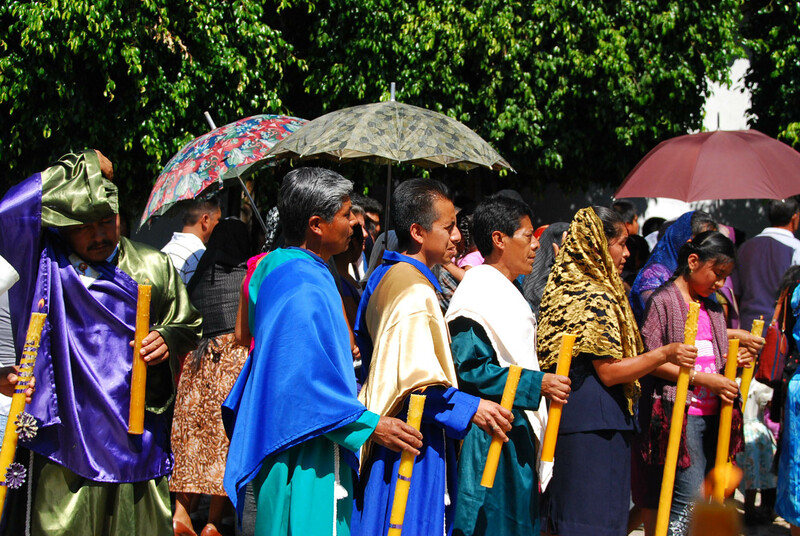 After a 7:30 a.m. mass, the volunteer church committee begins the procession followed by the townspeople. 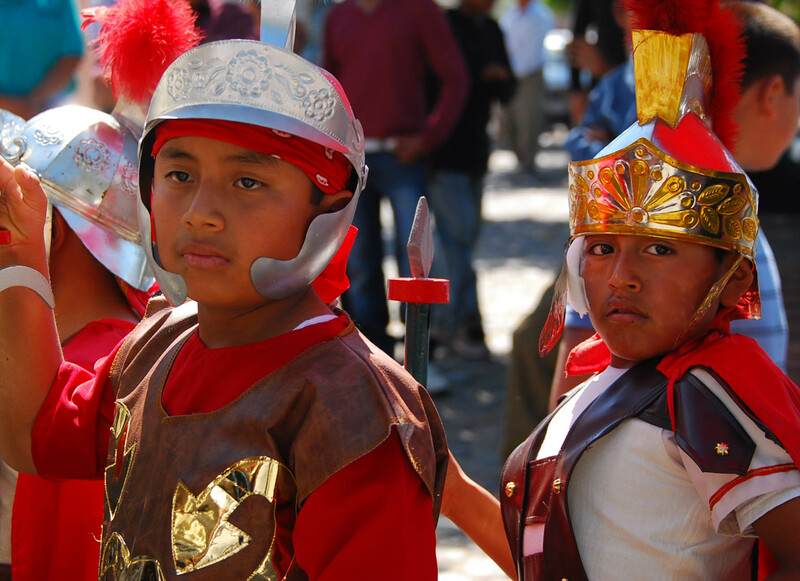 A key figure is the Centurion, represented by a young boy dressed in Roman soldier garb, and riding a beautiful horse. 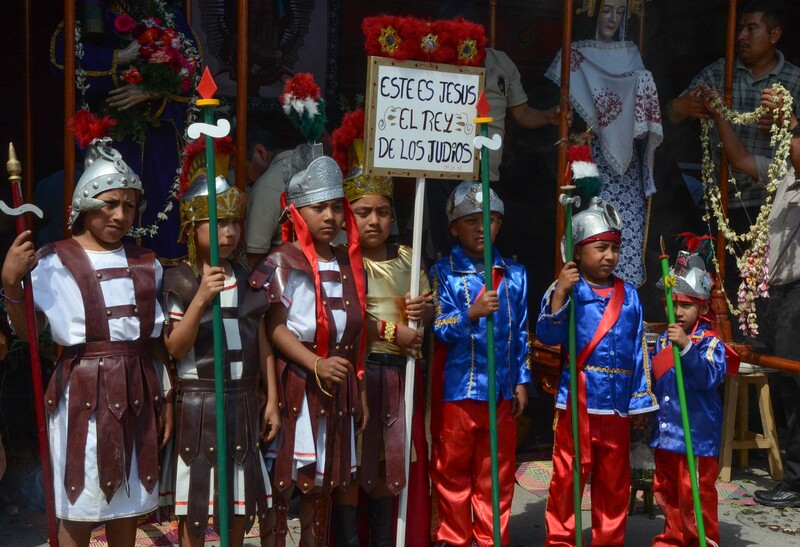 They are followed by a contingent of boy-soldiers, the legion of one hundred. 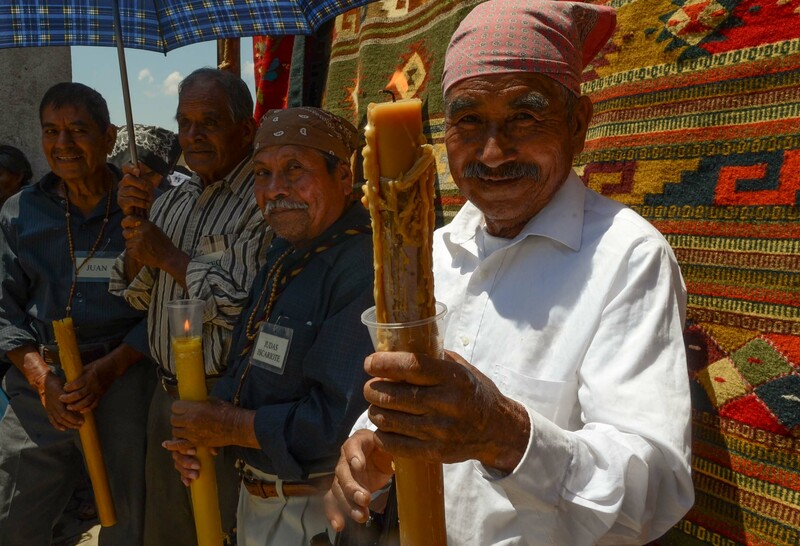 There are thirteen stops along the processional route where villagers in the procession stop to worship, take refreshment, and rest. 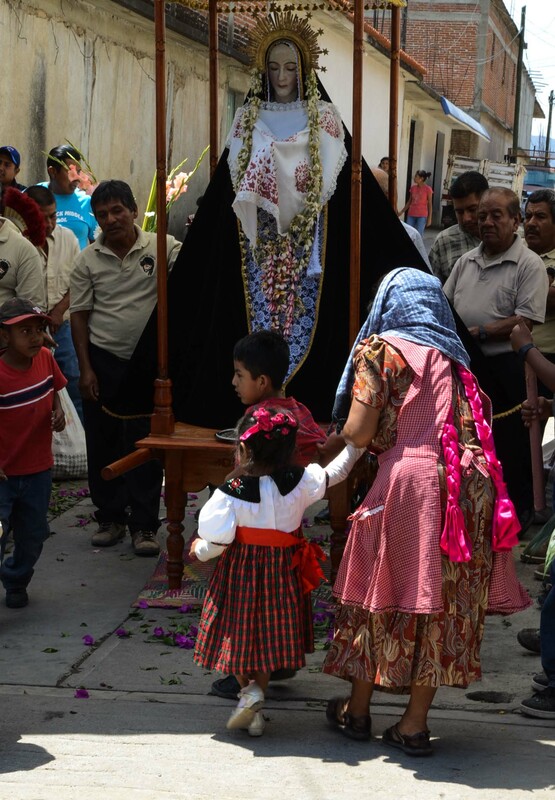 This is Teotitlan’s tribute to the pilgrimage along the Via Doloroso, Way of Sorrows and the Stations of the Cross. 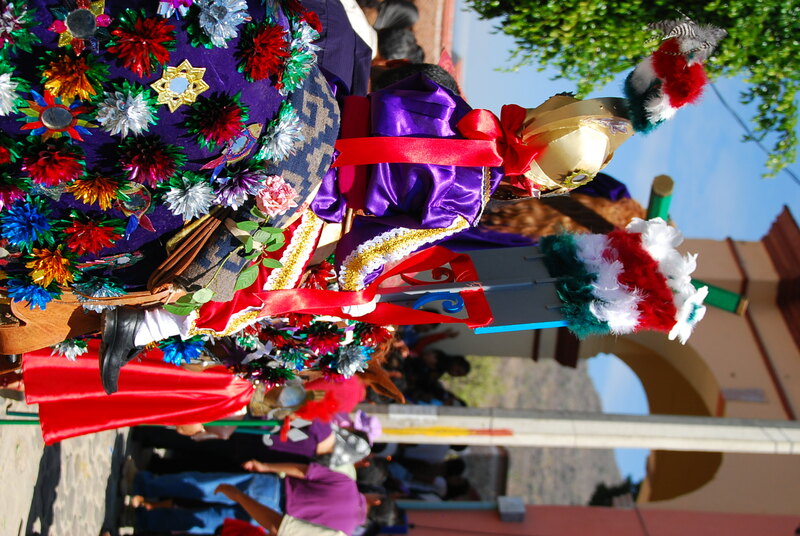 The altars may be ornately decorated with tapetes or handwoven rugs, which the people of Teotitlan del Valle are famous for weaving. 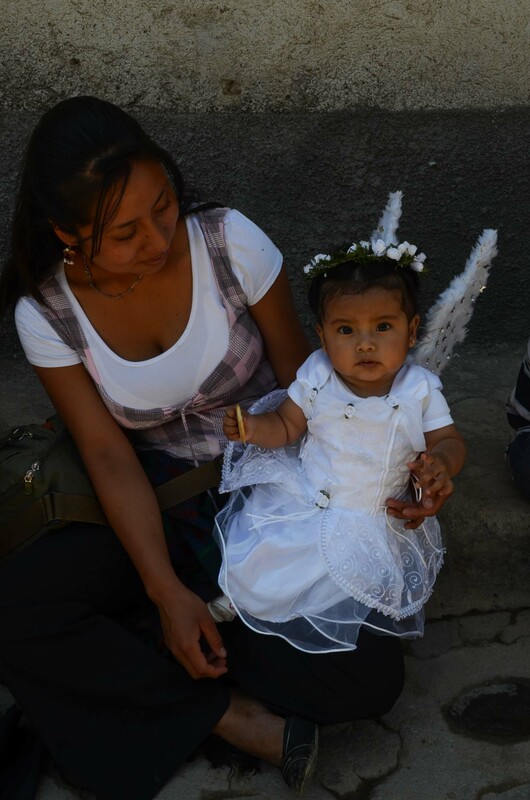 If Lunes Santo is about the solemnity of Easter, it is also about honoring infants and toddlers who are dressed like angels and represent the promise for new life and new beginning. 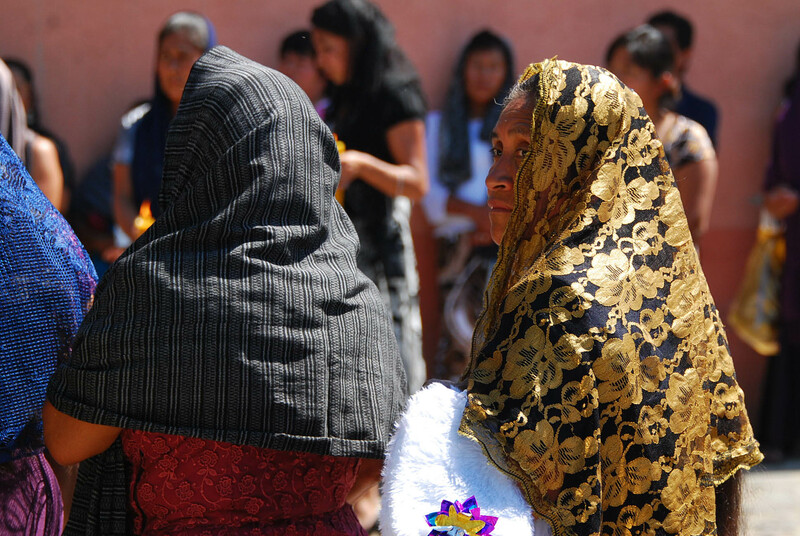 Many women wear purple, the color of royalty, symbolic of Jesus as king. 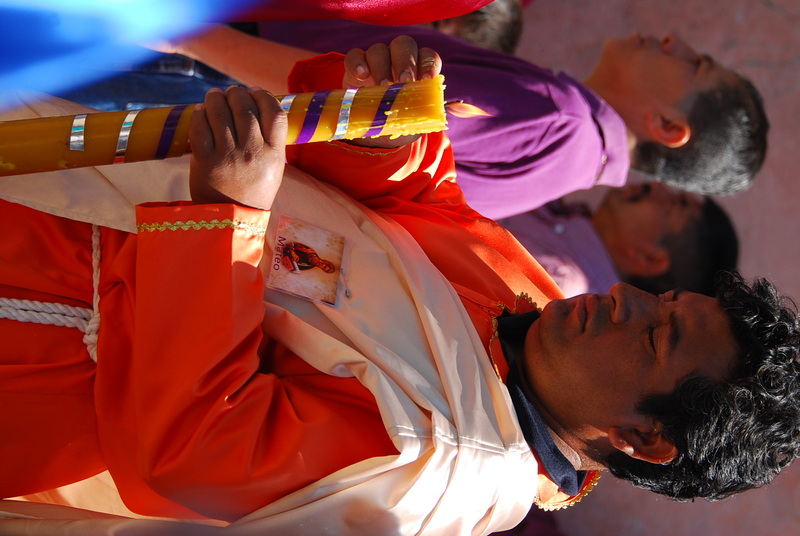 Both men and women carry lit beeswax candles, and a designated man at each stop hands out roses to the worshipers to lay before the altar. 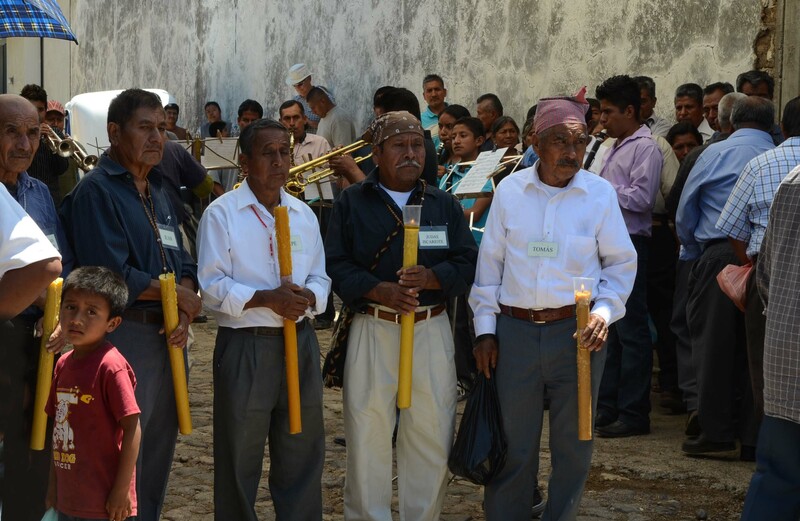 The aroma of copal incense and chanting fill the air, along with the sound of the village band out in front of the procession. At each stop, they take a rest too, then start up again as signal for the time to start walking again. It is a hot day and those who are not carrying umbrellas to shield them from the sun seek the shade along sidewalks where buildings cast longer shadows. 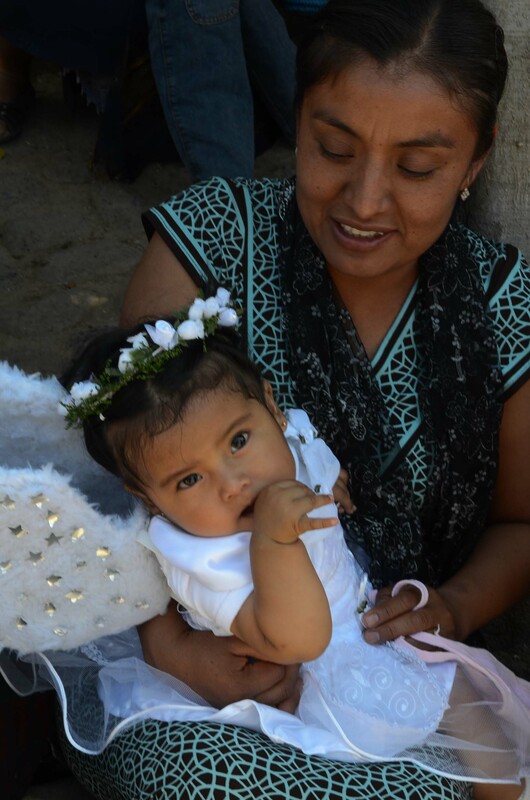 I picked up the procession in Section Three of the village, where I met up with friend Ernestina and her daughter Guadalupe, who we call Lupita. 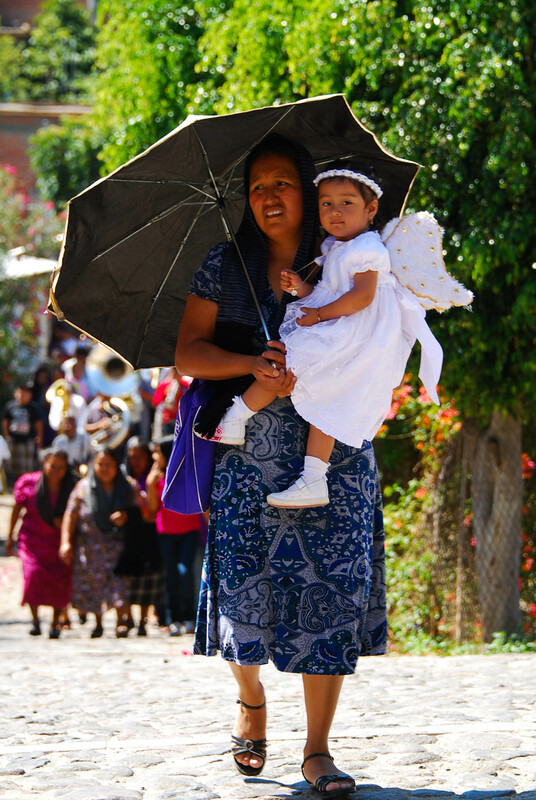 People here have a strong commitment to their families, their beliefs, and their desire to continue traditions that are centuries old and more, since most of Mexican Catholicism blends with the mysticism of pre-conquest indigenous practices. 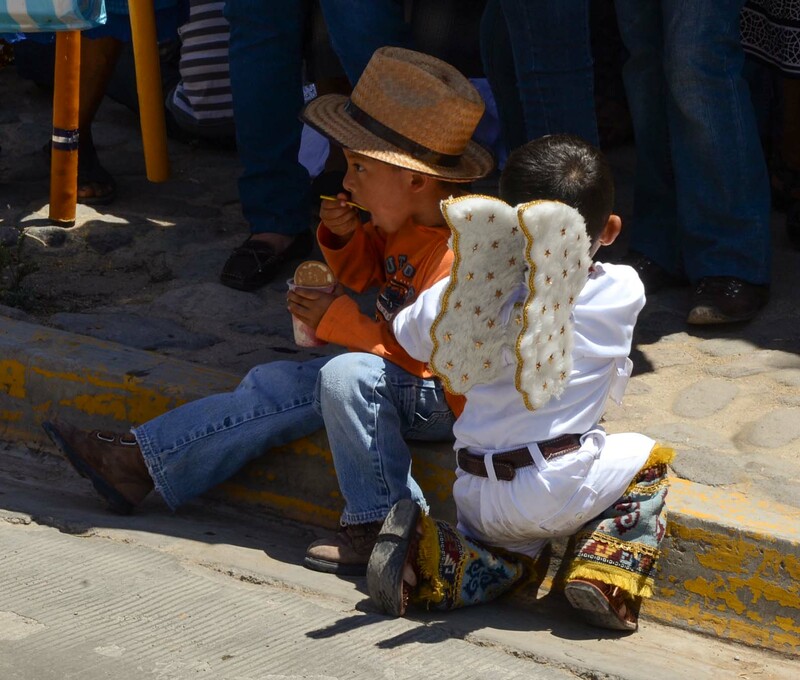 And, who can resist the resting stops with delicious offerings: tamales, locally made ice cream, and drinks. 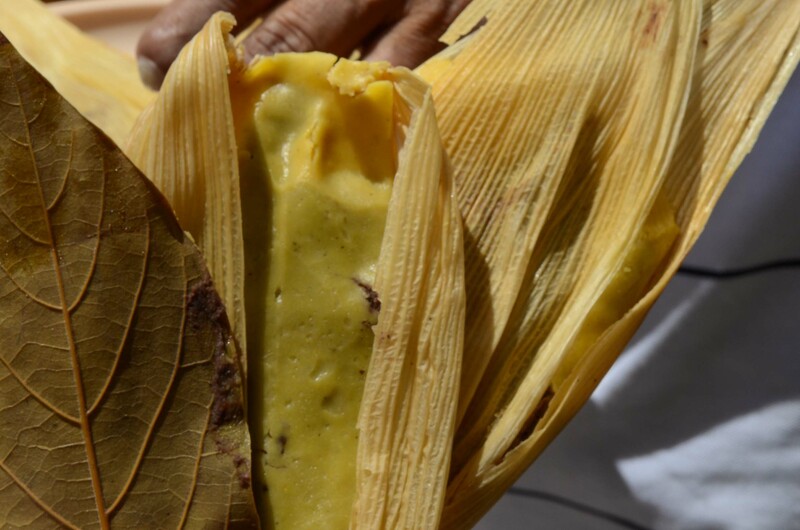 Today I had the most delicious bean paste stuffed tamal flavored with avocado leaf and a tamale with mole rojo and chicken. 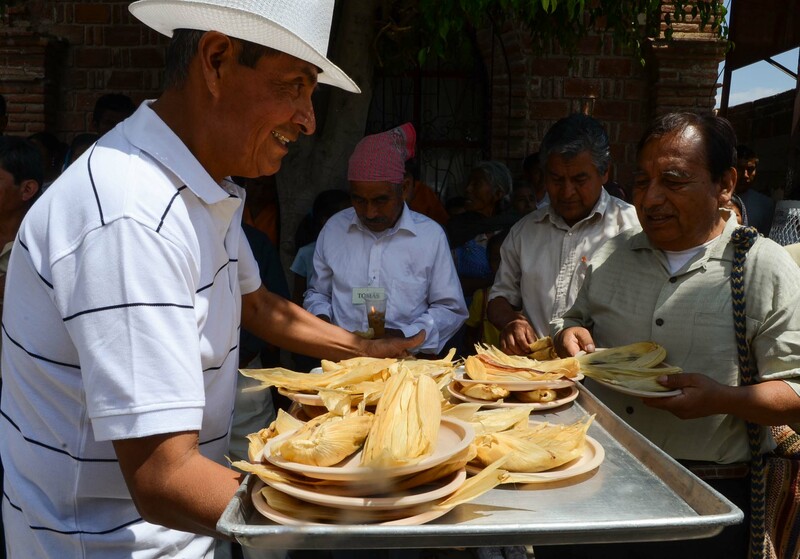 Each person in the procession got a plate of three at each stop! Thanks to the women who do the cooking and the men who serve and each family who supports the community. 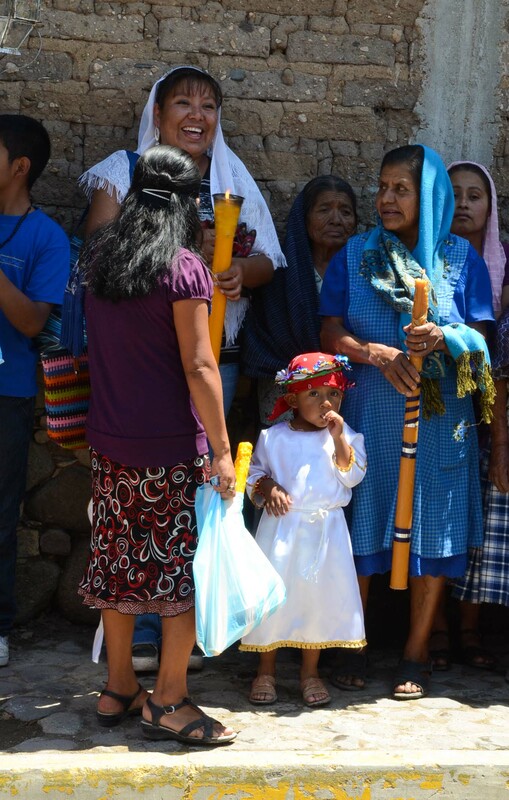 Then to quench thirst, the pilgrims are offered hibiscus flower juice (agua de jamaica) or atole, a corn, water and chocolate drink, special for celebrations and served in hand-painted gourds. 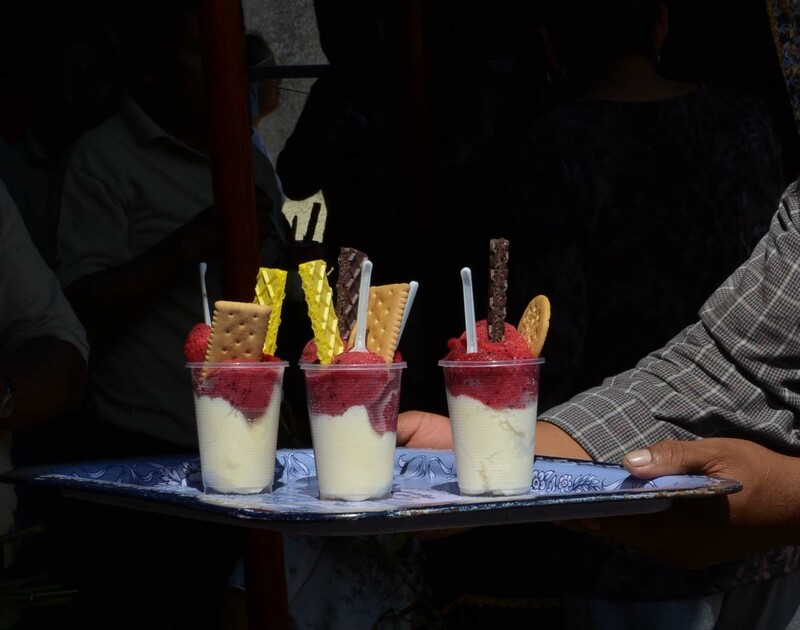 Children and adults alike loved the nieves, the Mexican flavored ices. 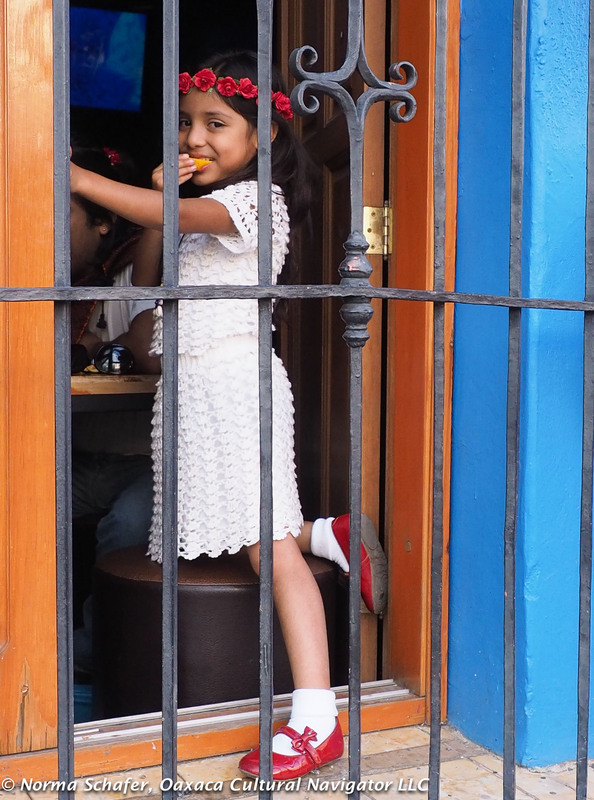 Today we had tuna and nuez (tuna is the fruit of the nopal cactus and nuez is nuts) or lime sorbet with mamey ice cream, with a cookie to top it off. 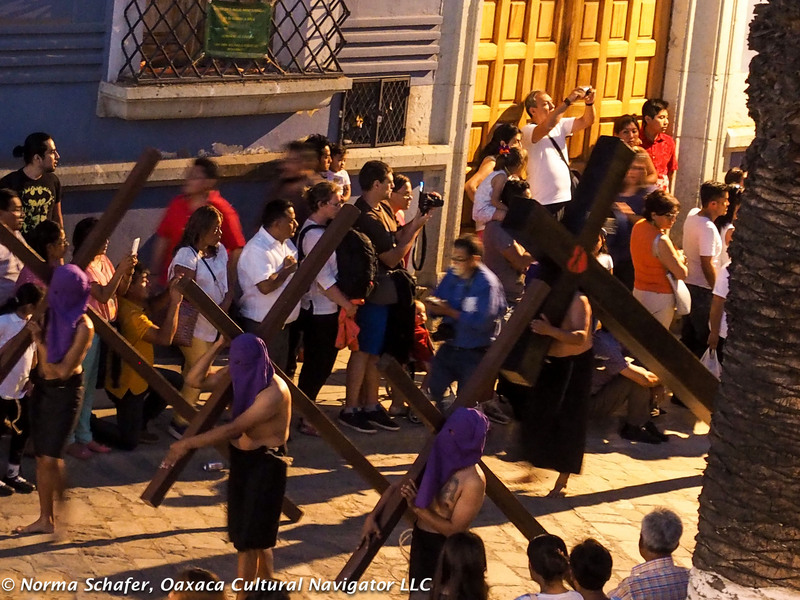 Today, we are immersed in the reverence and solemnity of Good Friday, moving along with the crowds to photograph the religious and social rituals that are part of this important day. 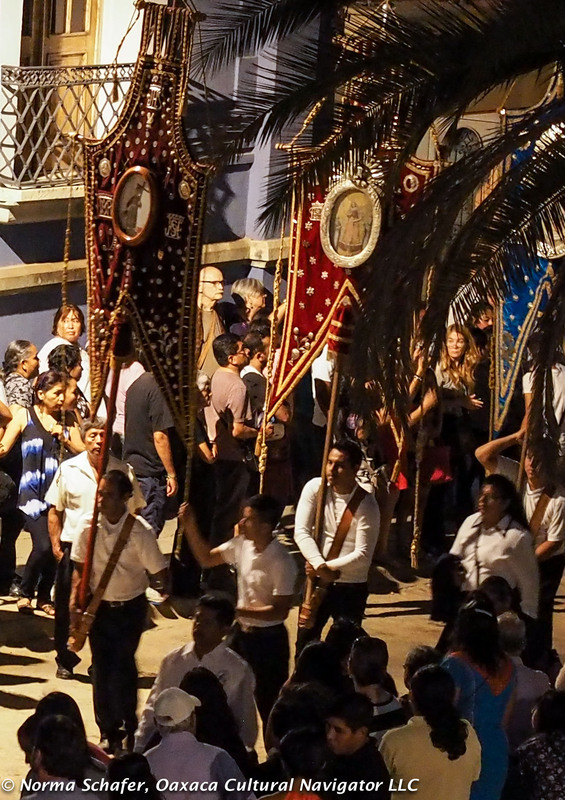 Here in Oaxaca, Mexico it’s called Viernes Santo and celebrated with traditional European-style that very different from the United States. 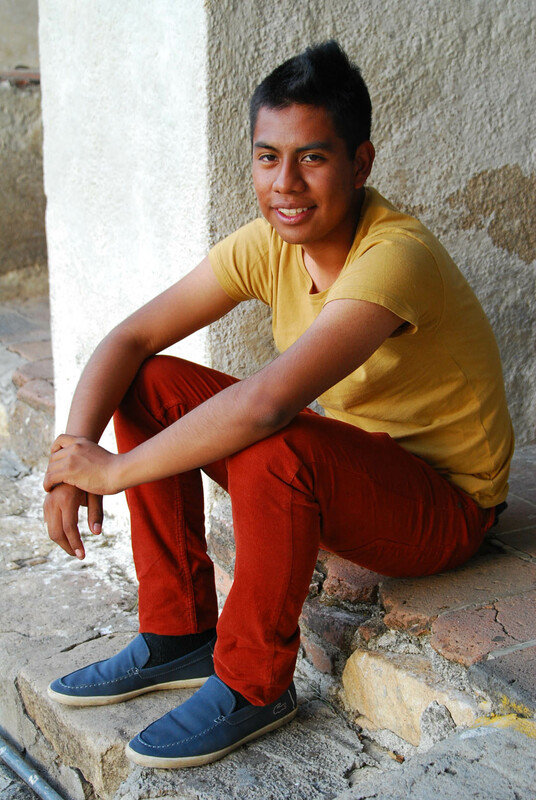 We are based in Teotitlan del Valle for the second part of our portrait photography workshop. The giant matraca (wood clackers), positioned on top of the church between the two steeples, started yesterday evening on Maundy Thursday and went on all night. It can be heard throughout the village. To signify the Last Supper, our host Josefina served us succulent fish stuffed chiles rellenos and a potato turnover with salsa, accompanied by white beans to signify the season. 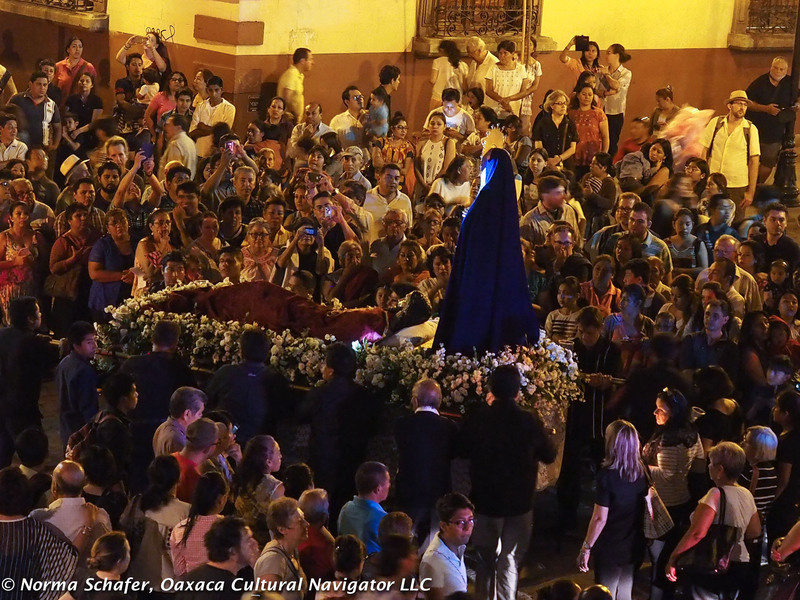 This day, Good Friday, began with not one but two processions, one led by half the townspeople following the figure of Jesus held high on a litter, and the other led by the Virgin of Soledad (solitude) who represents Mary. 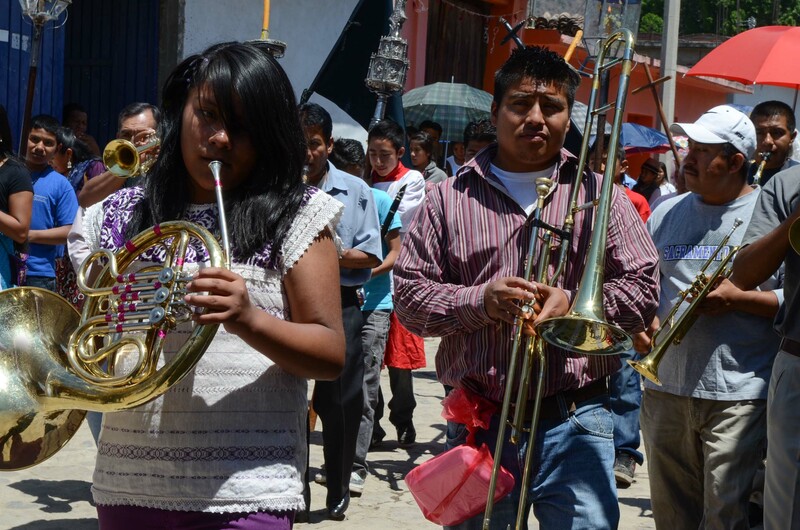 Each procession was led by a brass band, singers, noisemakers and drummers through different parts of the village. 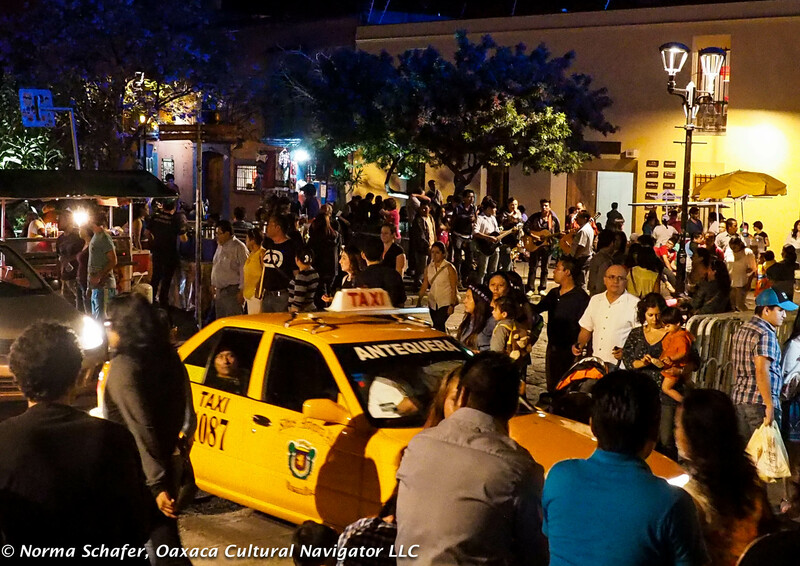 They converged at the exact same moment in the Zocalo in front of the village governing center called the Municipio or Palace. 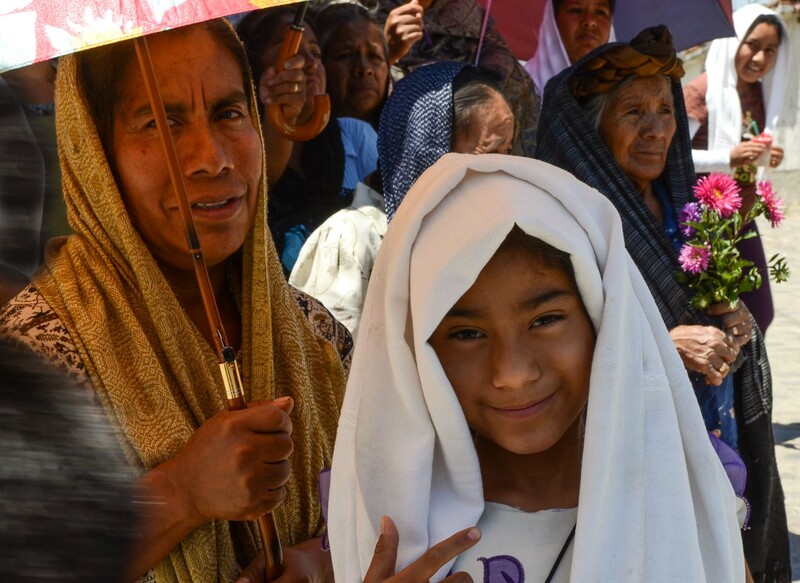 There must have been 600 people sitting under the shade of the rug market, on the steps of the Palace and protected by umbrellas from the fierce sun that was strong even at ten o’clock in the morning. 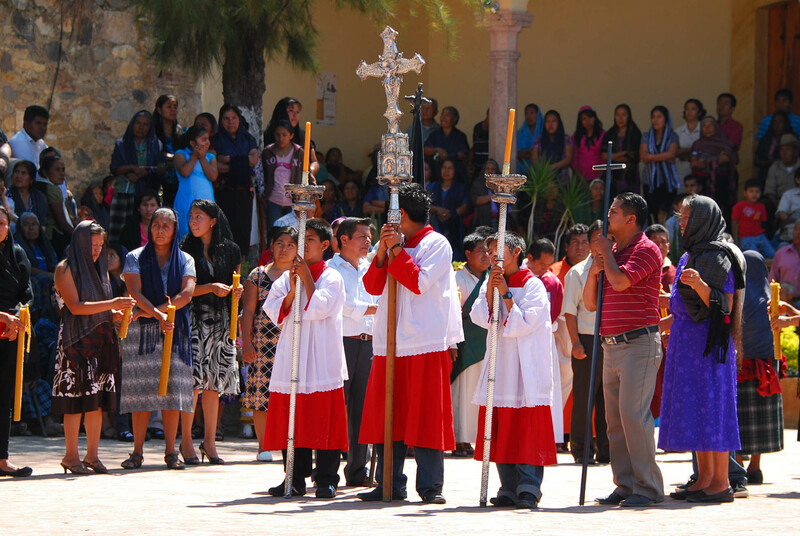 The priestly benediction included adhering to the ways of Jesus to refrain from violence, alcoholism, and to maintain strong community and family connections. A good universal message, I thought. 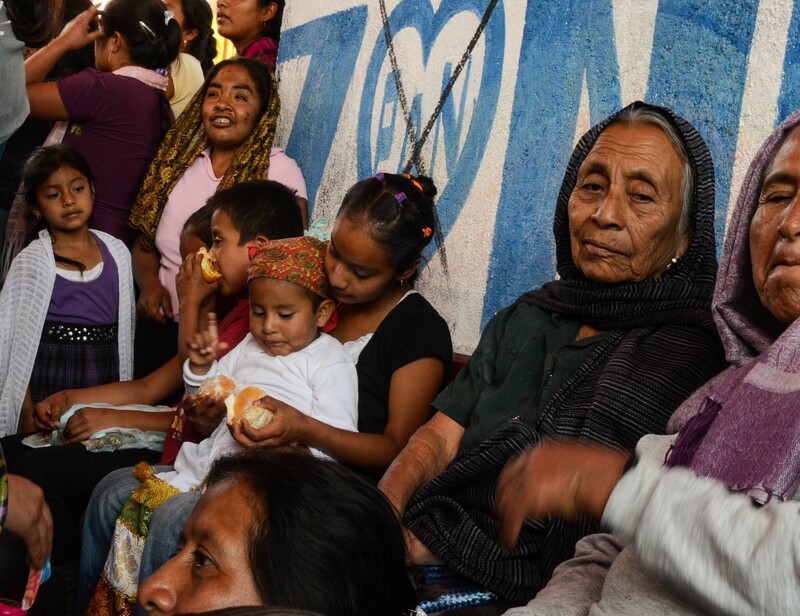 This is a reverent and solemn occasion for the people of Teotitlan del Valle. Most here take their religious life seriously and are observant. 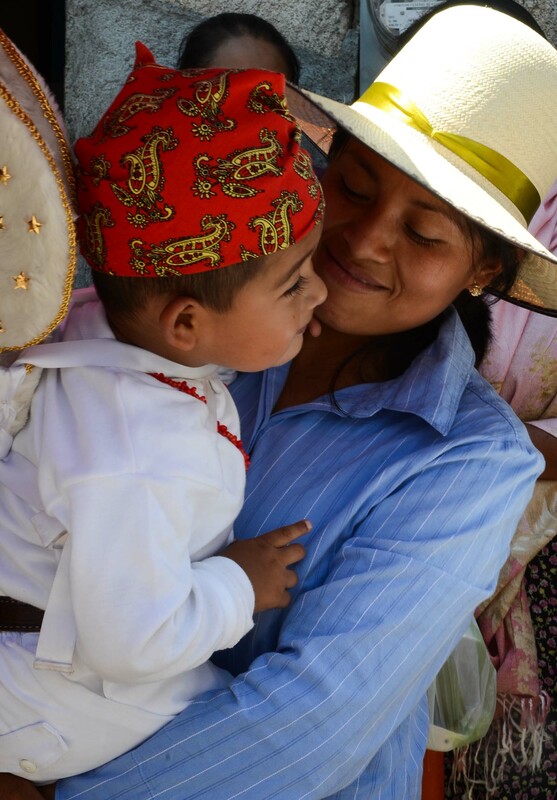 I was impressed by the mix of husbands and wives and children, young men and women, as well as the traditional abuelas and abuelos (grandmothers and grandfathers) who participated today. It was not unusual to see entire families sitting together or standing for the hour-long priestly blessing. 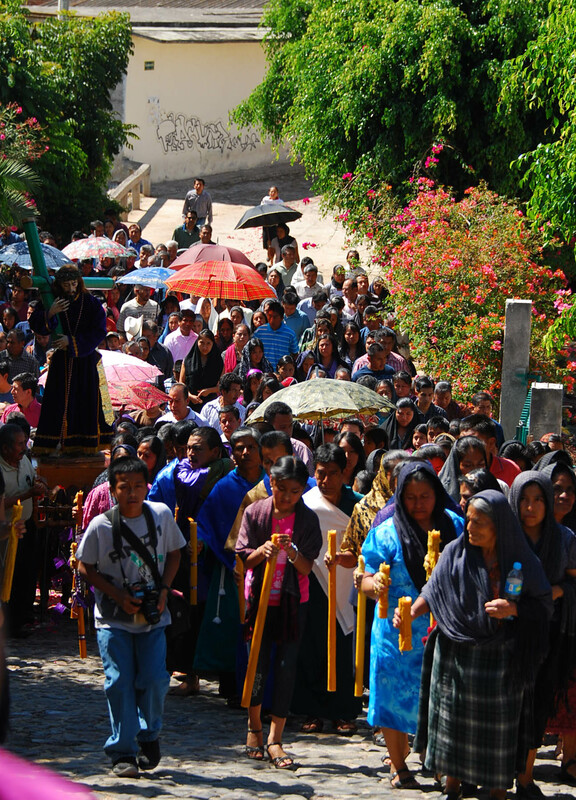 There is no mass on Good Friday as is the custom. 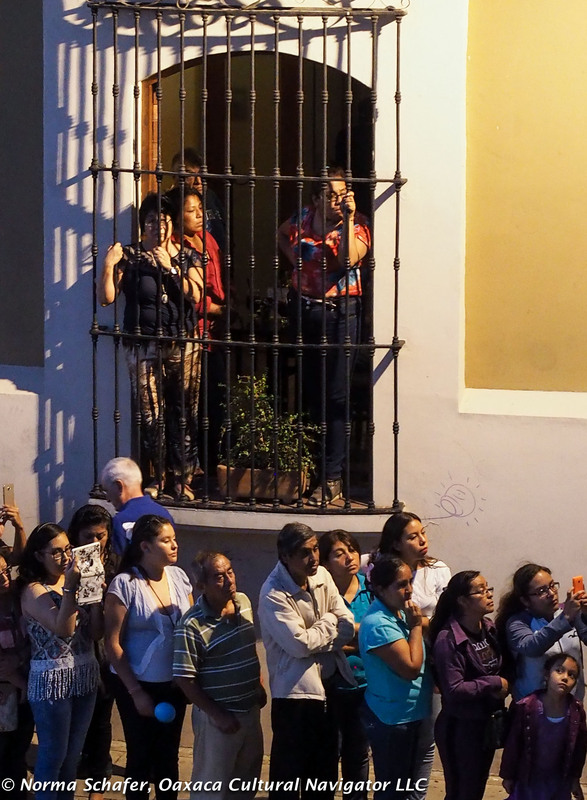 In the magic light of late in the afternoon, the people processed from the church to the cemetery and then back again. This will complete the spiritual connection with dead loved ones, as well. 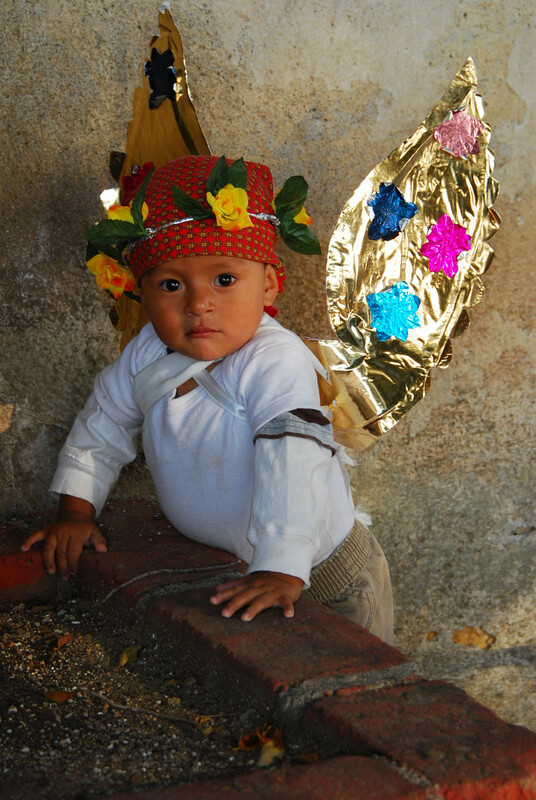 Our next photography workshop is this summer 2012: Oaxaca Photography Expedition: Market Towns and Artisan Villages. Two spaces left. Don’t miss it!